SATRA is one of Europe’s foremost European Notified Bodies for certifying protective helmets, and is able to carry out testing and EC type examination work using established European standards or in house developed test specifications. Deputy Chief Executive, Austin Simmons explains design principles and the tests involved. Accidents involving head injuries are common, and it is estimated that during the course of a year, millions of people will be treated for head injuries throughout Europe. Of these, 1% are serious with the victim suffering a lack of consciousness for a period of time. Recuperation from head injuries is often slow and in some cases the consequences of the injury include brain damage with only a partial recovery depending on the damage suffered. Head injury can arise from blunt impact or a skull penetration and result in direct injury at the impact site. Indirect injury may also be caused by movement of the brain within the skull leading to serious bruising on the opposite side of the head from the impact, or disruptive injuries to the nervous system and blood vessels from shearing or rotational forces as the head is accelerated and decelerated after the impact. Traumatic brain injury may be categorised as primary (damage occurring at time of impact) or secondary (injury as a result of neurophysiological and anatomical changes such as those caused by internal bleeding and blood clotting for instance, minutes to days following the accident. Head injuries can result in physical problems such as loss of co-ordination, difficulty in speaking, muscle rigidity or paralysis. Other associated problems include epilepsy, loss of sight smell or taste, and increased fatigue. Lapses in memory, attention and concentration can also result from head injuries and behaviour and personality may change with increased anxiety, depression, loss of motivation, difficulty controlling anger, and impulsiveness. Whilst it is not practical to wear protective headgear for all possible circumstances, safety helmets are proven to save lives and reduce injuries when worn in a variety of industrial and leisure situations. Typical industrial applications, include fire fighters and building workers in the construction industry, whilst common sporting activities include horse riding, rock climbing, canoeing. Obviously, wearing appropriate safety helmets cannot stop accidents happening, but can help prevent some injuries and reduce the severity of others. The majority of helmet standards are produced by two organisations. The European Union has developed an extensive range of helmet standards - many of which have been adopted by other countries. CEN, the organisation responsible for developing European standards has now produced standards covering the safety and performance requirements for most types of commonly used industrial and sports helmets. The American Society for Testing and Materials Standards (ASTM) technical committee F- 8.53 is responsible for producing helmet related ANSI standards. There are also a number of niche sports related standards developed at national level. For instance BSI, the British Standards body has developed a standard for cricket helmets whilst the Irish national standards body NSAI has recently produced a standard to cover helmets worn in the sport of hurling. Regardless of who developed the standard, they generally have many common features and typically detail the impact performance, protective coverage area and restraint requirements for different types of helmet. Helmets that provide any form of protection require ‘CE’ marking if they are supplied into Europe, and are covered by the requirements of European Directive 89/686/EEC the Personal Protective Equipment (PPE) Directive. The PPE Directive details procedures to be followed by the manufacturer to demonstrate compliance. The procedures vary depending on the type of hazard that the PPE is intended to provide protection against and the Directive splits PPE into one of three categories ‘simple’, ‘intermediate’ and ‘complex’. Helmets mainly fall in the ‘intermediate’ category, if industrial helmets are designed to provide protection against high voltages they are ‘complex’ PPE. A ‘Notified Body’ must assess an example of all protective helmets before the ‘CE’ mark can be affixed. This process is known as ‘EC type examination’ and includes checks on design, performance, and recommended use. If products are satisfactory then a certificate is issued indicating compliance with the Directive. ‘Complex’ products are also subject to ‘on going conformity’ checks on subsequent production by the Notified Body, either by testing production batches or quality assurance audits of the manufacturers facilities. In general, head protection is intended to guard the wearer in two main ways. 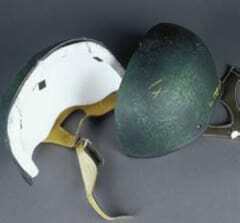 Helmets are designed to resist the effect of being hit by a falling or thrown object. They are also intended to protect the wearer from head injury when participating in activities, where sudden dynamic contact with the ground or some other hard object is likely. Most types of helmet are constructed with a hard outer shell made from a resin/fibre composite, such as fibreglass, or carbon fibre or a moulded thermoplastic or polycarbonate. Inner materials are generally energy absorbing expanded polystyrene or a similar material. The hard outer shell is intended to prevent skull penetration and major distortion and also helps reduce transmitted forces through the helmet. The liner is intended to act as a shock absorber further reducing transmitted forces through to the head. The theory behind helmet design takes into account the effect that a sudden impact has on the brain. At the point when the wearers head is impacted - perhaps hitting the ground after a fall for instance, the head experiences a sudden deceleration. The outer shell of the helmet experiences a sudden stop, however the head continues to move until it presses against the inner liner. The helmet shell should be robust enough to prevent penetrating injuries and it also absorbs energy as it flexes or distorts during the impact whilst the liner is intended to deform in a relatively controlled way, absorbing energy to slow the head down without causing serious damage to the brain. The helmet inner liner is particularly important for this aspect. The lining should compress, controlling the impact energy and extending the head’s stopping time by about six thousandths of a second (6 ms) to reduce the peak impact to the brain. Underneath the skull, the brain is wrapped in three layers of tissue called the meninges, and floats in a special shock-proof fluid to stop it from getting bumped on the inside of the skull during normal body movement. The outer layer of the meninges is called the dura. This is tough and thick and it is intended to restrict the movement of the brain within the skull. This protects the brain from movements that may stretch and break brain blood vessels. However, during significant impacts the brains protection is insufficient to prevent the brain from colliding with the skull. The result is potential brain damage such as shearing of the brain tissue or bleeding in the brain, or bleeding between the brain and the dura, or between the dura and the skull. Any bruising or bleeding that occurs internally can cause inflammation making the brain swell, with serious consequences for the victim. Whilst good design has an influence on helmet performance, increased impact protection for instance, is generally achieved by increasing the strength of the outer shell and shock absorbing properties of the inner lining. Technology limitations generally mean making materials thicker or denser to achieve this, thus increasing the size and weight of the helmet. This in turn affects the ergonomic attributes of the product, which can make people reluctant to wear it or introduce additional hazards - neck related injuries for instance (some helmet standards have a mass limitation for this reason). So in reality, protective helmets are generally a compromise between protection and ergonomics. The introduction of modern plastics reinforced with aramid fibres for instance, has enabled the development of tougher helmet outer shells. The inner lining needs to be substantially impact aborbing and deformable. Expanded polystyrene is popular but polyethylene and polyurethanes are used as well. It is important that the liner does not rebound back into its original shape otherwise the brain will effectively be thrown back again increasing further the possibility of injury. Ideally the momentum of the head should be slowed down and brought to a controlled stop. This is fine in theory, but in practise to minimise brain injury, a substantial thickness of relatively light weight deformable material is required. In a helmet, this is impractical and therefore manufacturers use a thinner but denser material, although this has the advantage of reducing the volume and size of the helmet, it does compromise the protection offered. A number of factors influence helmet performance. Despite various designs and requirements for different types of helmets, most work on the principle of attempting to protect the user’s head through a mechanical energy-absorption process, with the structure and protective capacity generally altered in high-energy impacts. Energy from any impact is absorbed by the helmet, which therefore reduces the force of the blow to the head. Whilst achieving this, the helmet may be weakened or damaged. This may not always be visible, especially in the case of thermoplastic materials. Whilst the outer shell is often cracked on impact, other helmets appear visually satisfactory after test, but in fact the outer shell has been deflected inwards momentarily and compressed the lining, which does not recover its original shape. The helmet is therefore permanently weakened but this cannot be seen visually without removing the lining which is often glued in place. For this reason, protective headwear should be replaced if subjected to a serious impact. and the user instructions that accompany many helmets recommend changing the helmet if it has been involved in an impact as its mechanical strength may have been compromised. The fit of the helmet is also crucial to its performance and it is generally recommended that it should be comfortable but close fitting. Restraints, where fitted, should be securely fastened and the chinstrap should be sufficiently tight to be under tension at all times. Regardless of application, most helmets incorporate a three point fixing system and tests have been developed to test the efficiency of this arrangement. A number of tests have been devised that assess the performance of the helmet under a variety of situations and environmental conditions. The method of establishing impact protection performance depends on the application. All tests are dynamic and involve either the helmet falling from a height onto a hard surface or a heavy object descending onto a helmet mounted below. Penetration tests using pointed objects are also often included. Accelerometers and load cells are used to measure the effects of impact. Whatever the method, impact tests involve the use of special rigid head forms manufactured generally from wood or aluminium and conforming to the requirements of various standards. These head forms are available in a range of sizes, and relate to the inside circumference of helmets, enabling different sized helmets to be tested. The head forms also incorporate chin and neck areas for testing the retention mechanisms of helmets. Accelerometers and load cells are used to measure the effects of impact. Impact attenuation is measured using accelerometers. Triaxial or uniaxial accelerometers capable of measuring and recording accelerations in the order of thousands of g are mounted at the centre of gravity in the head form. The helmet and head form are sat in a cradle or ‘toilet seat’ and the assembly is dropped in a guided free fall using either a wire or rail guided apparatus onto an anvil fixed to a rigid base. The cradle ensures the helmet meets the anvil at the designated angle, without interfering with the dynamic reaction. Tests are repeated at different points on the helmet. Peak accelerations should not exceed 250 - 300g depending on the standard requirement. Impact anvils are shaped to suit the hazard being protected against eg kerbstone etc. Helmets designed to protect against falling objects are generally tested using load cells. EN 960 head forms, for example, are mounted onto a load cell, which in turn is attached to a large mass of concrete or steel. A helmet is mounted onto the head form in the manner in which it would be worn by a person and adjusted to ensure a minimal gap between the inside of the helmet and the outside of the head form. The assembly is positioned directly below a weighted guided wire striker that is allowed to fall from a height calculated to provide a specified impact energy in Joules. The resulting transmitted force should be in the region 5 - 15 kN as detailed in individual standards. Certain types of helmets incorporate ventilation holes or slots and these can be tested to ensure that sharp objects cannot cause injury. The helmet is mounted in such a way as to enable a pointed striker to impact directly onto the ventilation area. An electrical connection between the metal striker and head form indicates whether contact has been made. Retention of the helmet on the wearer’s head in an accident situation is particularly important and a number of tests examine this aspect of performance. The helmet is fitted to a head form and the retention system fastened as in use. A downward force is suddenly applied to the retention system via a load, and any resulting peak and residual displacements noted. This includes buckle slippage. The effectiveness of the retention system is also checked using a ‘roll off ’ test. The helmet is attached to a head form in the normal manner of use. A load is applied in front of the peak via a wire attached to the rear edge of the helmet. The load is applied suddenly and any rotation noted. Advances in material technology dictate future improvements in helmet performance and manufacturers are able to make protective helmets lighter through the use of modern materials and improved design. However, whilst a well-made and well-fitted helmet can provide a degree of protection against brain damage resulting from an accident, design and material limitation means that it is highly unlikely that all injuries will be eliminated completely.